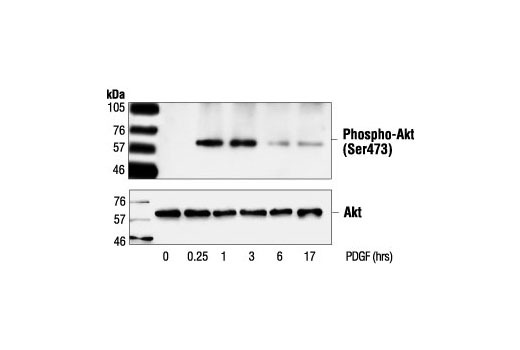 Western blot analysis of extracts from NIH/3T3 cells, untreated or PDGF-treated (50 ng/ml) for the indicated times, using Phospho-Akt (Ser473) Antibody #9271 (upper) or Akt Antibody (lower). 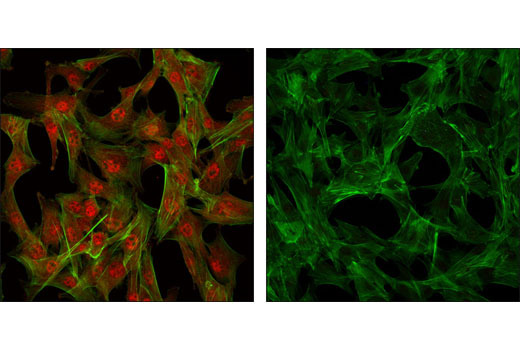 Confocal immunofluorescent images of C2C12 cells showing nuclear and cytoplasmic localization with Akt Antibody (left, red) compared to an isotype control (right). Actin filaments have been labeled with fluorescein phalloidin. Flow cytometric analysis of Jurkat cells, untreated (blue) or LY294002-treated (green), using Akt Antibody compared to a nonspecific negative control antibody (red). 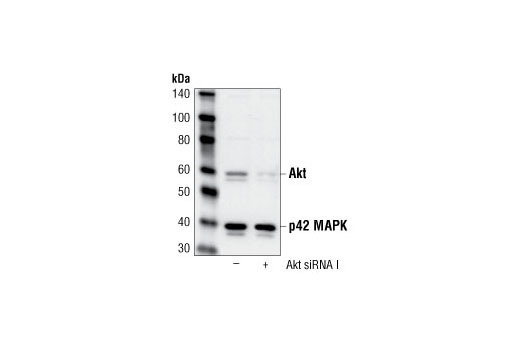 Akt Antibody detects endogenous levels of total Akt1, Akt2 and Akt3 proteins. 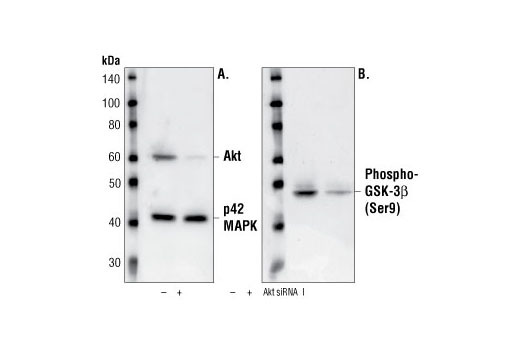 The antibody does not cross-react with related kinases. Polyclonal antibodies are produced by immunizing animals with a synthetic peptide corresponding to the carboxy-terminal sequence of mouse Akt. Antibodies are purified by protein A and peptide affinity chromatography.